There seems to be no better experience than swimming with dolphins, but in fact there is one; we’re talking about swimming with happy, healthy animals in habitats that have everything a dolphin needs. How can we achieve this? 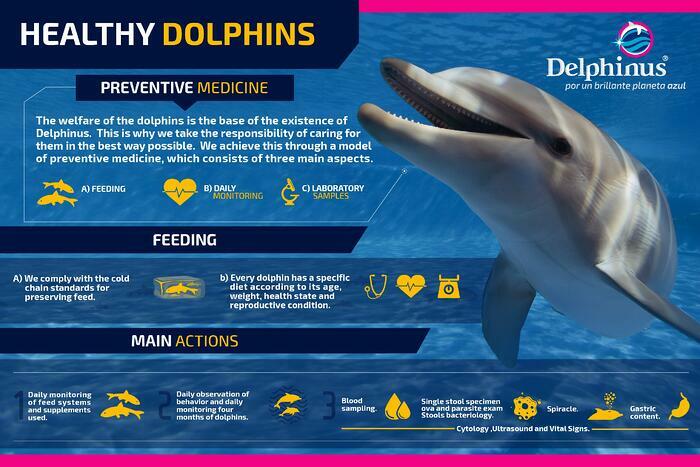 To achieve a balanced habitat for our Delphinus dolphins, it’s very important to practice very specific preventive medicine, which we have thanks to the daily observation of every one of our dolphins. We constantly take laboratory samples, also each and every one of our Animal Care Specialists monitor each dolphin daily. Thanks to this observation it is possible to detect behavior changes in any one of our dolphins. Thanks to a log which everybody in the Delphinus team has access to, which is dumped in a very specialized software called SANO, where they can register any kind of behavior or health alteration, the most important information is at hand at every moment. Daily observation and registry of the dolphins' behavior, diet and health. Quarterly veterinary monitoring of each dolphin species. Blood, stool, stool bacteriology and spiracle sampling, revision of gastric contents and cytology, ultrasound and review of physiological constants. Besides the preventive vet care we give the dolphins, their feeding is carefully monitored, that is why all the fish they eat comes from United States, and every dolphin has a very specific diet according to its age, weight, health status and general characteristics. Swimming with dolphins has never had a bigger meaning as it has it now, live this incredible experience with the experts, and see how much we love dolphins in Delphinus.